A List of DIY Canvas Wall Art Ideas and Projects along with links that will lead you to detailed step-by-step instructions. There are plenty of simple DIY canvas wall art ideas, and today our Home Improvement Channel will share you a splendid picks of canvas arts ,most of which barely involve anything beyond a trip to the stationery store at the best. Drawings, Buttons, ribbons, paints are common materials you can create on wall, but do you know you can create far more artistic works that you have done before. 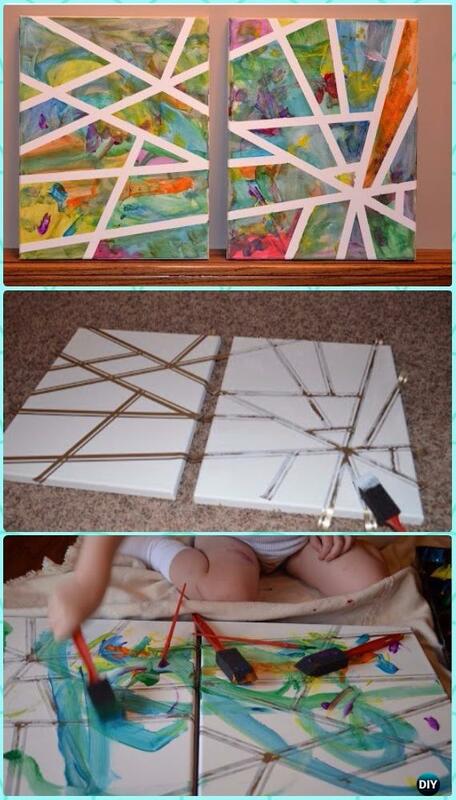 Do you want to try the canvas art that you want to get your kids or even your little toddlers can involve? From colorful paper and crayons to spray paints and tapes, crochet or glue, these canvas crafts will bring you and your family lots of fun with stunning outputs. Here we put together this selection of handmade art ideas for your next project. So why wait, scroll down and pick your favorite and get started creating your own unique DIY arts! Paper heart can be arranged into pretty flowers, cut different sizes of paper hearts, fold in half and glue them on convas for any patterns.